More than 260 million people use tobacco in various forms in India, the number of users in rural areas being three times more than that in urban areas. In India, tobacco is smoked in the form of beedis and cigarettes or using devices such as hookah, hookli, chhutta, dhumti, or chillum.,, Hookah (hubble bubble Indian pipe) is an indigenous device, made of wooden and metallic pipes, used for smoking tobacco. The tobacco smoke passes through water kept in a spherical receptacle, in which some aromatic substances may also be added. Hookah smoking is a popular method of socializing among the village folk, especially in the Northern and Eastern parts of India, and has been a part of the rural cultural life and thus socially acceptable in the country. The National Sample Survey in the year 2000, India, reports the household prevalence of hookah tobacco as 2.6% in rural and 0.4% in urban households. The Global Youth Tobacco Survey reported that the prevalence of hookah use among children age 13–15 years varied from 6% to 34% in the surveyed countries. Over a period of years, hookah smoking has now spread its roots in urban areas and is becoming highly popular among the youth. Review of global trends has made epidemiologists believe that this increasing use of hookah among youth represent “the second global tobacco pandemic” since the introduction of cigarettes. New forms of electronic hookah smoking, including steam stones and hookah pens, have now been introduced. These products are battery-powered and turn liquid containing nicotine, flavorings such as apple, mint, cherry, and other chemicals into a vapor, which is inhaled. Most adolescent users think it is less harmful, although hookah smoking has many of the same health risks as cigarette smoking. The charcoal used to heat the tobacco exposes the individual to high levels of carbon monoxide, metals, and cancer-causing chemicals., Hookah tobacco and smoke contains toxic agents known to cause lung, bladder, and oral cancers., The amount of smoke inhaled during a typical hookah session is about 90,000 mL, compared with 500–600 mL inhaled when smoking a cigarette. Some molasses-based sweetened and flavored nontobacco products are sold for use in hookahs and are made available at common markets and e-commerce platforms. Studies of tobacco-based hookah and “herbal” hookah show that smoke from both preparations contain carbon monoxide and other toxic agents known to increase the risks for smoking-related cancers, heart disease, and lung disease. Section (4) of the Cigarettes and Other Tobacco Products Act (COTPA), 2003 (Prohibition of advertisement and regulation of trade and commerce production, supply and distribution) prohibits smoking in public places and defines a public place as one the public can access. A loophole was identified in the rules that stated “only smoking and no other services shall be allowed” in smoking areas, which was being exploited by some hotel and restaurant owners to offer hookah services. The changing consumer lifestyle, supported by the younger population base of India, has given a boost to e-commerce business and the sector has been growing at a breakneck pace. The opportunity is being exploited by the manufactures to sell their “herbal” hookah to the consumers and the fact is of critical importance as tobacco e-commence can threaten the integrity of comprehensive tobacco control programs in the country. Evidence shows that exposure to marketing of the unhealthy products through social media platforms may impact adolescent health behaviors. Social media depictions of tobacco have also been found to be more important than exposure to TV and movie depictions of smoking in predicting subsequent smoking behavior. Hookah smoking has taken off well with the adolescent target group, as it provides a social setting, an activity and novelty rolled into one, along with a manufactured illusion of relative harmlessness. Peer pressure and the desire for social acceptance are other factors. Given the social nature of hookah use and online advertising of growing hookah venue businesses, the aim of this study was to assess the content of online retail markets offering Hookah products in India. A content analysis of online retail market was conducted on one of the most popular search engines, Google India, using three keywords. Seven popular retail websites were screened manually for availability of hookah products; of them, four websites having the highest number of brands of hookah products were chosen. A total of 15 themes were developed and used to describe various promotion strategies for hookah products. Sites that did not offer online sales were excluded. After the websites were identified, two were searched as part of the pilot study using three most common “keywords” (hookah, hookah products, and shisha) and 15 themes which were popularly used were developed to promote hookah products. The final study was performed by the same investigators and web search was conducted during July–August 2017; “keywords” were used to search the first five pages on each online retail website selected. Of the 15 themes, the 12 most common ones were included in final analysis. The themes were as follows: (1) model description: which included the type (hookah apparatus, flavors, charcoals, e-hookah, and accessories), their size, appearance, style, and model number. When a website had two different models of a single brand, they were considered separately. If versions varied in color or flavor but had the same model name, then they were considered as one; (2) sociability: promoted for use in friends circle, party, hangout; (3) alternative to cigarettes; (4) age-specific warnings; (5) health safety warnings; (6) tobacco-free or 0% nicotine claim; (7) harm reduction claim; (8) romantic themes; (9) market-promoting catchwords: two categories were found, “emphasis on product” such as style, appearance, and color, and “emphasis on need” such as produces heavy smoke, thick clouds, and dense smoke; (10) discounts; (11) price (in rupees); and (12) glamorizing claim: words such as supreme, exotic, legendary were used as market promoting strategy. Data were stored on a computer, on which individual folders were made pertaining to each retail website. After appropriate coding of websites, themes, and measures, data were analyzed using SPSS version 21. A total of 46 brands of hookah products were found on the four retail websites. These brands had a total of 382 products, out of which 214 (56%) were unique and 168 (44%) were repeats, which were not included in the analysis. Hookah apparatus were the most popular products displayed on websites, forming 59.8% (128), followed by pocket hookah (e-hookah) comprising 15.9% of products (34), the next most common item. Hookah flavors, charcoal, and accessories such as hose pipe, mouth piece, and foil punctures contributed to the remainder. All products were displayed with images of the hookah apparatus/product, with colorful (e.g., gold, green, red) and ornate illustrations of hookah of various sizes and shapes. None of the products was seen with a picture of an individual/celebrity using the product. A total of 41 (19.2%) products claimed to be tobacco/nicotine-free. Discount was available in 184 products (86%), and almost half of these products were available on a price less than rupees 500. The detailed data for remaining measures are presented in [Table 1]. Out of the various promotional strategies, glamorizing words for describing products in form of superior, premium, and legendary were found on 189 (88.3%) products. Only 14 (6.5%) products displayed age- and health-specific warnings. Eight products (3.7%) claimed to be a healthier alternative to cigarettes or helping to quit smoking. Other promotional strategies are presented in [Table 2]. With the growing penetration of technology facilitators such as Internet connections, and broadband services together with an increasing acceptance of the idea of virtual shopping, e-commerce has become the need of the day. This digital age, in which youth are increasingly online, presents both challenges and opportunities for influencing their health and well-being. On one hand, we find a rising concern to control the accessibility of tobacco-related products with anti-tobacco campaigns; on the other hand, products such as hookah are made available at our doorsteps through virtual markets, that too at discounted rates. This study found that barely 6% of the hookah products sold online displayed any age-specific or health-related warning. Section 6 of COTPA 2003 provides a clear need to protect the children and youths from tobacco use by restricting easy access of tobacco products to the minors. But with a huge Internet consumer base of around 500 million (as of 2018), second largest in the world after China, this law enforcement could be threatened. Close to 20% of the products were described with words such as herbal and safer than cigarettes since they claim to be selling sweetened and flavored nontobacco products for use in hookahs. Despite their claims, studies have proven yields of carbon monoxide, nitric oxide, volatile aldehydes, nicotine, tar, and polycyclic aromatic hydrocarbons, contradicting advertising messages that “herbal” hookah products are a healthy alternative to tobacco products. Availability of flavors might compel consumers to try each variant and could even affect future tobacco use. 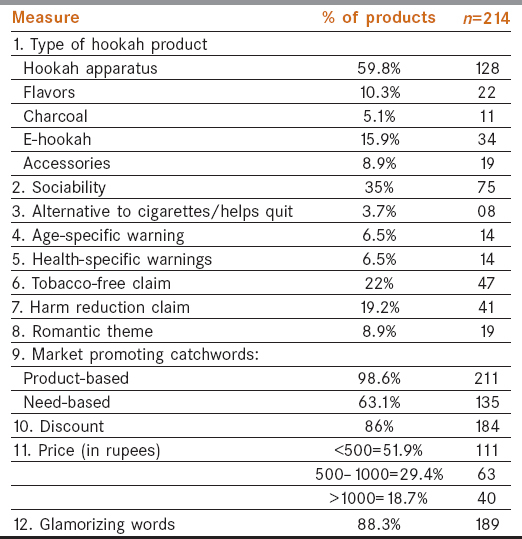 More than one-third of the products were promoted as a must-have product for any friend's get-together or party, using words such as “ultimate way to celebrate” and “perfect excuse to chill with your friends.” The presentation of hookah use as a complex social ritual that creates unique social structures may add to the compeling nature of hookah tobacco smoking. There is strong evidence that adolescent exposure to advertising and other tobacco media imagery in traditional media increases subsequent tobacco use. Market promoting phrases such as “Unlimited Fun with Minimal Fuss” seem to target the beginners and the young and make it sound easy for those who have no previous experience of smoking. Every little accessory such as hookah foil, stylish hose pipes, foil puncturing device, and even mouth pieces was selling online and was describing the product as the most fashionable thing to own. Close to 90% of the products were available at discounts, and more than half cost less than rupees 500 (7.78 US dollar). The websites also give facility of cash on delivery and even free shipping services. Youth who are not addicted to smoking but are rather attracted by the exotic looking hookah products since they are considered to be in vogue are more sensitive to prices. Peer influence is another factor which plays a role when a young individual chooses to smoke. Low-cost availability of these products along with the glamorizing descriptions is a very smart marketing strategy. WHO FCTC Article 13 promotes a comprehensive ban of all forms of “TAPS” (Tobacco Advertising and Promotion) which means “any form of commercial communication, recommendation or action with the aim, effect or likely effect of promoting a tobacco product or tobacco use either directly or indirectly.” The advantages are that it prevents glamorization of tobacco use, reduces social acceptability of tobacco use, reduces cues that reassure tobacco users, especially for those interested in quitting, and frees the media from commercial influences so that they are more likely to report openly on tobacco issues, but the major loophole that remains is that viral promotions using new media technology such as the Internet, text messaging, and direct mail are not banned. The promotion strategies of online hookah sellers are no different from those selling tobacco elsewhere. The regulation of Internet as a marketing and communication tool is in a nascent stage in India. In 2000, the Government passed the Information Technology Act  intended to provide a comprehensive regulatory framework for e-commerce. It is important that monitoring and enforcement of the laws related to selling of such products online should be in place with dissuasive penalties. This novel study provides insight into the hookah products marketing in India. The study has been done on the most popular retail websites functioning in India, hence provides an actual view of the conditions prevailing in the Indian virtual markets. It could prove to be an eye opener as the promotors of hookah products have clearly evaded the laws and regulations in the country and managed to take their products right at people's doorsteps. The study does have its limitations; our search was limited to the first five pages of four websites due to time constraints, and a more extensive search might have added some more aspects. Other websites which sell only hookah products exclusively have been left out; a peek into them could have also added to the results. The marketed aesthetic appeal, claims of being healthy alternatives, and heavy discounts offered makes it challenging to persuade people of its potential harm and addictiveness. Hence, public health practitioners and policy-makers need to raise the issue of various hookah products in the same tune as done for other forms of tobacco. There is a need to emphasize that the product used in hookahs could be containing tobacco and that the smoke nevertheless contains combustion products similar to the smoke from cigarettes. We might make use of the same online platform which has “normalized” hookah use at homes and in the society to create awareness. GATS-2 Global Adult Tobacco Survey Fact Sheet India. 2016–2017. Available from: https://mohfw.gov.in/sites/default/files/GATS-2%20FactSheet.pdf. [Last accessed on 2017 Feb 08]. Gupta PC. Survey of sociodemographic characteristics of tobacco use among 99,598 individuals in Bombay, India using handheld computers. Tob Control 1996;5:114-20. Bhonsle RB, Murti PR, Gupta PC, Mehta FS. Reverse dhumti smoking in Goa: An epidemiologic study of 5449 villagers for oral precancerous lesions. Indian J Cancer 1976;13:301-5. Chadda RK, Sengupta SN. Tobacco use by Indian adolescents. Tob Induc Dis 2002;1:111. John RM. Household's tobacco consumption decisions: Evidence from India. J South Asian Dev 2006;1:101-26. Morton J, Song Y, Fouad H, Awa FE2, Abou El Naga R, Zhao L, et al. Cross-country comparison of waterpipe use: Nationally representative data from 13 low and middle-income countries from the Global Adult Tobacco Survey (GATS). Tob Control 2014;23:419-27. Aslam HM, Saleem S, German S, Qureshi WA. Harmful effects of shisha: Literature review. Int Arch Med 2014;7:16. Maziak W, Taleb ZB, Bahelah R, Islam F, Jaber R, Auf R, et al. The global epidemiology of waterpipe smoking. Tob Control 2015;24(Suppl 1):i3-12. Hookah Tobacco (Shisha or Waterpipe Tobacco).U.S. Food and Drug Administration Website. Available from: https://www.fda.gov/TobaccoProducts/Labeling/ProductsIngredientsComponents/ucm482575.htm. [Last accessed on 2017 Feb 08]. Trend AE. Waterpipe Tobacco Use. American Lung Association; 2007. Cobb CO, Ward KD, Maziak W, Shihadeh AL, Eissenberg T. Waterpipe tobacco smoking: An emerging health crisis in the United States. Am J Health Behav 2010;34:275-85. Shihadeh A, Salman R, Eissenberg T. Does switching to a tobacco-free waterpipe product reduce toxicant intake? A crossover study comparing CO, NO, PAH, volatile aldehydes, tar and nicotine yields. Food Chem Toxicol 2012;50:1494-8. Ministry of Law and Justice (Legislative Department), India. Cigarettes and Other Tobacco Products (Prohibition of Advertisement and Regulation of Trade and Commerce, Production, Supply and Distribution) Act, 2003. New Delhi: The Controller of Publications; 2003. Press Trust of India. No hookah services in smoking zones as govt tweaks rules. Hindustan Times. Available from: https://www.hindustantimes.com/business-news/no-hookah-services-in-smoking-zones-as-govt-tweaks-rules/story-zPswD1TC45DuhfWqLdPEKP.html. [Last updated 2017 May 26]. Ayyar R. Number of Indian internet users will reach 500 million by June 2018, IAMAI says. The Times of India. Available from: http://timesofindia.indiatimes.com/articleshow/62998642.cms?utm_source=contentofinterest&utm_medium=text&utm_campaign=cppst [Last updated on 2018 Feb 20]. Dunlop S, Freeman B, Jones SC. Marketing to youth in the digital age: The promotion of unhealthy products and health promoting behaviours on social media. Media Commun 2016;4. Ray CS. The hookah – The Indian waterpipe. Curr Sci 2009;96:1319-23. Mohanty VR, Chahar P, Balappanavar AY, Yadav V. Electronic Nicotine Delivery Systems (ENDS): Mapping the Indian Online Retail Market. Nicotine Tob Res 2017;19:1386-9. Tobacco ritual and anti-ritual: Substance ingestion as a history of social boundaries. In: Collins R, editor. Interaction Ritual Chains. Princeton, NJ: Princeton University Press; 2004. p. 297-337. Lovato C, Linn G, Stead LF, Best A. Impact of tobacco advertising and promotion on increasing adolescent smoking behaviours. Cochrane Database Syst Rev 2003;4. Tobacco Advertising, Promotion and Sponsorship (TAPS). World Health Organization. Available from: http://www.who.int/tobacco/publications/building_capacity/training_package/tp3_tobacco_advertising.pdf. [Last accessed on 2018 Feb 08]. The Information Technology Act, 2000. Ministry of Law, Justice and Company Affairs (Legislative Department). Government of India. June 2000 Available from: http://meity.gov.in/writereaddata/files/itbill2000.pdf. [Last accessed on 2018 Feb 08].